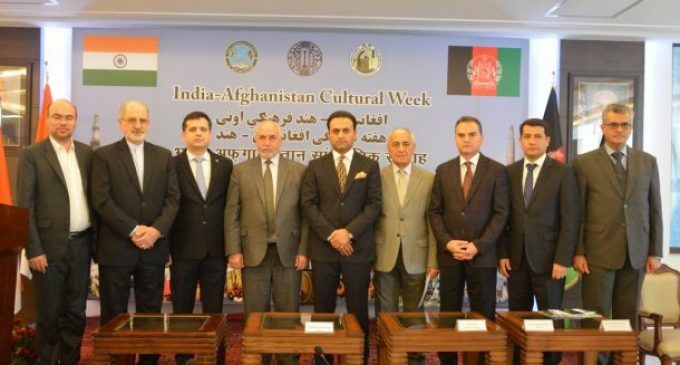 Realizing India-Afghanistan’s strengthening and deep rooted relation, the three-day Cultural week festival recently gave impetus to reinforce the continued bilateral relation of the two countries. The Afghanistan-India Cultural week programme mark token of sincerity for the contemporary relation comprising of diversity, tolerance, culture, humility, deep knowledge and understanding. 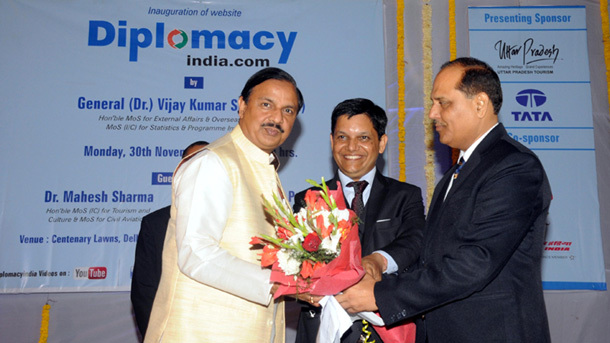 Prof. Mohammad Rasool Bawari, Acting Minister of Information and Culture of Afghanistan, Dr. Mahesh Sharma, Minister of Culture-Republic of India, Dr. Shaida Mohammad Abdali, Ambassador of Afghanistan to India as well as ambassadors including Iran, Tajikistan, Turkey, Nepal, Kyrgyzstan, Azerbaijan, Turkmenistan, Sri Lanka and a number of academic figures from both the countries had participated in inaugural ceremony of this seminar. The Cultural week celebrations were jubilant moment for Afghanistan and India. India’s connection with Afghanistan vice versa is vivid and both the countries cherish the valued relation based on mutual trust, cooperation and development partnership.The India-Afghanistan relation festival once again revives the eternal connection between the two countries.Dr. Abdali stated that “Throughout history Afghanistan had historical relation with Indiasince vedic, Buddhist and Bakhtari civilization. Thousands of scholars from Ghazni, Balkh, Kandahar, Hari or Herat, Farbyab, Badakhshan and Seestan illuminate the strength of Afghanistan’s relations with India and its other mythological aspects. Al-Beroni, wrote a book named as Ma Lalhind or Hindustan which received lot of appreciation over the years and serve as a significant resource for the scholars of India and Afghanistan. Rabindranath Tagore’s everlasting novel “Kabuliwala” reflects Indo-Afghans combined literature and cultural aspects in 20th century”. The dynamics of India Afghanistan relation thrives to boost the existing educational and cultural facilities.The Indian Council for Cultural Relations (ICCR) has been playing a prominent role in enhancing and building educational capacities in the neighbouring countries including Afghanistan through its various scholarship programmes. The initiatives taken by ICCR spelt impressive growth in mobilizing education system and helped the students to contribute in the work force and for the development of their country. Decades of war has devastated education system in Afghanistan. Education is the only yardstick to overcome difficult situation for any country and it is a ray of hope for a better tomorrow for Afghanistan. Afghanistan expects India to equip and administer Afghan students with quality education through training programmes that endeavours prospective opportunities back in their homeland.India’s effort in rebuilding education sector is immensely appreciated and acknowledged by Afghanistan. Almost 16,000 students are studying in India in various disciplines and scholarship programmes provided by Indian Council for Cultural Relations, trilateral programmes which includes international scholarships. Most Afghans unable to seek education in other international countries due to high cost, India is suitable to meet their education goals. The education system was badly impacted due to prolonged civil war. The growth and development of the country can only be stabilized and put on the trackby improved and effective education system. Almost 9.2 million children are enrolled in school of which 39% are girls, according to the Afghan Ministry of Education. There are around4,055 community-based education classes covering over 119,000 children in rural areas, including over 58,000 girls, have access to education. As per the Afghan Ministry of Higher Education public and private universities enroll around 300,000 students, including around 100,000 women.The increasing number of students in Afghanistan is a positive indication of the country’s effort in the development process. Imparting education is helping young men and women to find jobs as per their skills and potential. The youth in Afghanistan is the engine for inclusive and sustainable growth. As education is the pertinent factor for the prosperity of Afghanistan, international community must reflect on the reconstruction and the future development of the country. Education will bring forthAfghan Society’s modern dynamics reflecting the changing political, social and cultural policies in their country.